I moved to Paris when I was 26 after attending culinary school and working in French restaurants in Manhattan. I wanted to see and experience the real thing after learning about food in school. I loved being in Paris but was disappointed that everyone didn’t walk around the narrow streets of the 10th arrondissement wearing a beret and carrying a baguette under their arm! Oh, and I did gain a few pounds along with gaining a respect for the way Europeans shop, eat and appreciate what they have. Their regard for food and its presentation is much higher than ours. I ate all of the classic, traditional dishes including rich braises and stews cooked long and slow in little bistros throughout the City. 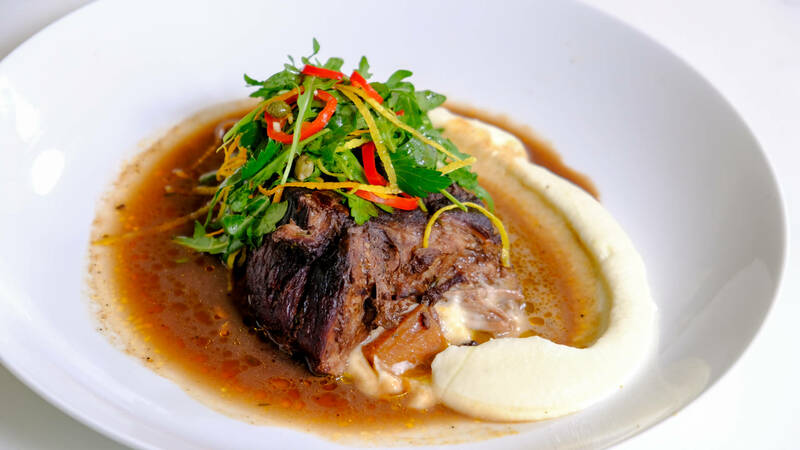 Short ribs are one of my favorite things to eat and this recipe brings together a Provençal classic, Beef Daube, and a Mexican mole. 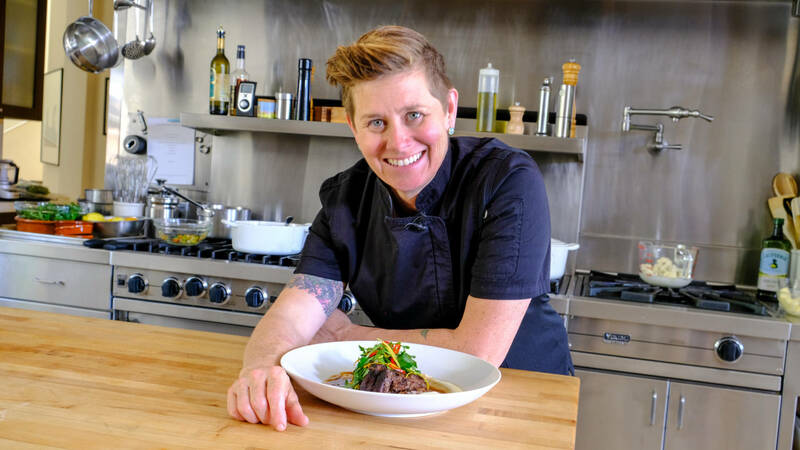 Its creation evolved from my time living in Paris, my experience cooking in French restaurants, particularly a beef cheek recipe that I made a lot at COCO5OO and then living in the Mission district where I was introduced to moles. I like mole a lot so when we opened Shakewell I added coffee, chocolate and dried chilies to my classic recipe to impart the mole flavors into this deliciously savory, complex dish. The ingredients are available in the Bay Area and it’s simple to make and tastes even better if made the day before. Trim any excess fat from the short ribs. Sprinkle with salt and pepper and set in a shallow dish; pour over red wine and cover with plastic wrap. Set aside to marinate for 2 hours or refrigerate overnight. Heat a Dutch oven over medium-high heat; pour in oil and swirl to coat. Add the short ribs in a single layer, browning on all sides. Add the wine from the marinade and reduce by half. Add the onions, fennel, carrots, garlic, fresh thyme, chilies, tomato paste, chocolate, coffee and stock. Bring to a lazy simmer and cover. Transfer to the oven and cook until the ribs are tender, 1/12 to 2 hours. If the sauce is a little thin you can remove the meat and vegetables and reduce the sauce by one third then strain through a fine strainer. To serve: Spoon a dollop of the Cauliflower Puree in the center of 8 plates. Set the short rib on top and spoon over some of the sauce. Arrange the Citrus Gremolata on the short rib, drizzle with a little additional extra virgin olive oil and serve. In a medium saucepan, combine cauliflower with enough water and the milk to cover. Bring to a boil and cook until very tender, about 10 minutes. Drain and allow to dry. Using a slotted spoon, transfer the florets to a food processor and process until pureed. Slowly add the hot cream and butter and process until smooth. Season with salt and white pepper to taste. In a large bowl, combine the lemon and orange zest, garlic, capers, arugula, parsley and Fresno chili. Season with salt and pepper and drizzle with lemon juice and olive oil.